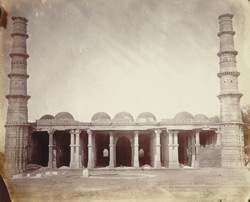 Photograph of Sayyid Uthman's Mosque at Isanpur, Ahmadabad in Gujarat, taken, by order of Major Cole, by an Army sergeant in c. 1881, from the Archaeological Survey of India. This is a view of the eastern façade of Sayyid Uthman's Mosque, which was built in 1460. It is one of the first mosques to have its minarets at the ends of the facade rather than on either side of the central entrance. These minarets are covered in moulding and panels, typical of Gujarati stone carvers. The entire front of the building is open, the pillars inside are arranged in four rows with pilasters along the back wall. Two balcony windows are positioned at either end of the mosque.